said on Monday that Pakistan made huge investment in bettering security for the protection of the visiting teams due to which it has been made possible to bring back international cricket to the country. He was addressing a news conference here along with Chairman, Pakistan Cricket Board, Najam Sathi at a local hotel after the arrival of the World XI to play Independence Cup three T20 international series, commencing from tomorrow, Tuesday at Gadaffi stadium. set-up Safe City Project to ensure the safety of the people of the city and for the protection of the foreign visiting teams. year was the turning point which helped in convincing the ICC to send its World XI to Pakistan for the resumption of international cricket. the foreign players and its successful organization was a step forward for bringing back international cricket to Pakistan”,he said,adding,”Had the final was not played in Lahore it could have been very difficult to see the resumption of international in Pakistan”. agencies and the Punjab Government for improving the security to a level where the foreign teams are feeling comfortable to visit Pakistan. for ensuring the return of international cricket to Pakistan. in Lahore which changed the perception of cricket playing countries about Pakistan and security”,he added. coach,Andy Flower for assembling a top notch side which has the services of majority of the cricket playing nations. Plessis is a cricketer of a big stature and it is going to be an exciting and challenging series between the World XI and the Pakistan in this week “,he said. 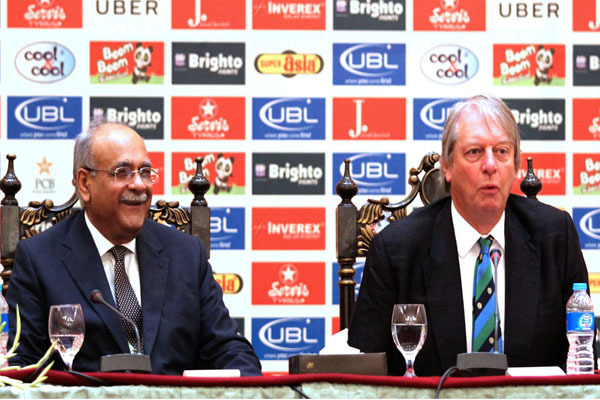 Giles Clarke was of the view that it is not just a cricket series,it is more than that as people of Pakistan waited a long time to see the resumption of international cricket. international cricket because of their passion and interest in the game and I am confident that stadium will be full during the three match exciting series”,he said. Praising Pakistan team’s performance in cricket at international level, especially in the champions trophy,he said it (team) put up an impressive show by winning the Champions trophy outclassing a fancied opponent. ICC official said Pakistan has come a long way to see the return of international cricket in the country and in coming months Sri Lankan and West Indies teams will also be visiting Pakistan. Chairman PCB, Najam Sathi termed the Independence Cup beteen the World XI and Pakistan ‘a special cricket event’, saying it is not just a cricket event. He said after the tour of World XI, Sri Lanka the West Indies , a lot of cricket activity will be seen next year in Pakistan as far as international cricket is concerned. “World XI has the services of five South African players and I think we will not be facing difficulty in convincing them regarding their full team to visit Pakistan in due course of time”,said PCB Chief. To a question, he said with the tour of World XI ,Pakistan wants to give a positive message to the world that it is peace loving country which is waging a war against terrorism. Najam Sathi gave credit to the Zimbabwe team for its visit to Pakistan two years ago for supplementing the efforts of the PCB for the resumption of the international cricket in the country. He said PCB will continue its efforts to motivate other cricket playing countries to send their teams to Pakistan under the Future Tour Porgramme.